During the first quarter of 1982 the likelihood of war between Great Britain and Argentina seemed inevitable. 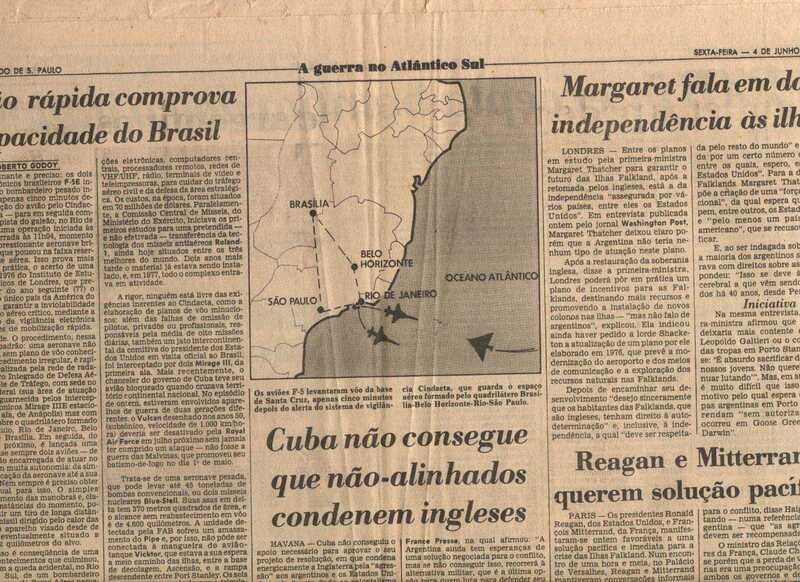 The Argentinean forces had invaded a small island group located in the South Atlantic, northeast of the southern tip of South America. Although the Falklands [or Islas Malvinas as the Argentineans called them] only have a total area of about 12,173 sq km (4650 sq miles) the Argentine authorities demanded sovereignty of them sighting the fact that in 1816 the ruling Spanish had been overthrown by the Argentine army, and thus the islands belonged to them. However it appears that as early as 1592 an English navigator called John Davis first encountered the rocky outcrop and proclaimed it as British. Seventeen years after the 1816 Argentine uprising the British regained control of the Falklands Isles. However Argentina protested that they were by rights Argentinean property. Much political wrangling went on, and in the mid-1960's the United Nations were called in to try and settle the dispute. 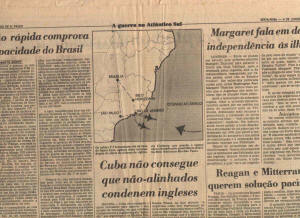 These talks were still continuing in April 1982, when Argentine military forces invaded and occupied the islands. This attempt to use force to decide the outcome of the sovereignty dispute led to a state of war being declared by Prime Minister Margaret Thatcher. A number of missions were planned which involved dropping 21,000lbs of high explosive bombs onto the only runway on the Falklands. This was situated at Port Stanley, and was being used by the Argentine forces to deliver munitions to their troops stationed on the Island. 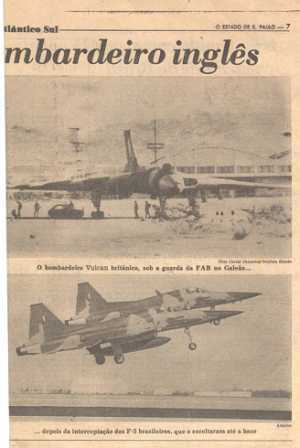 It was also assumed that, given time, the Argentine air force would use the runway as a base for Mirage and Skyhawk fighters. 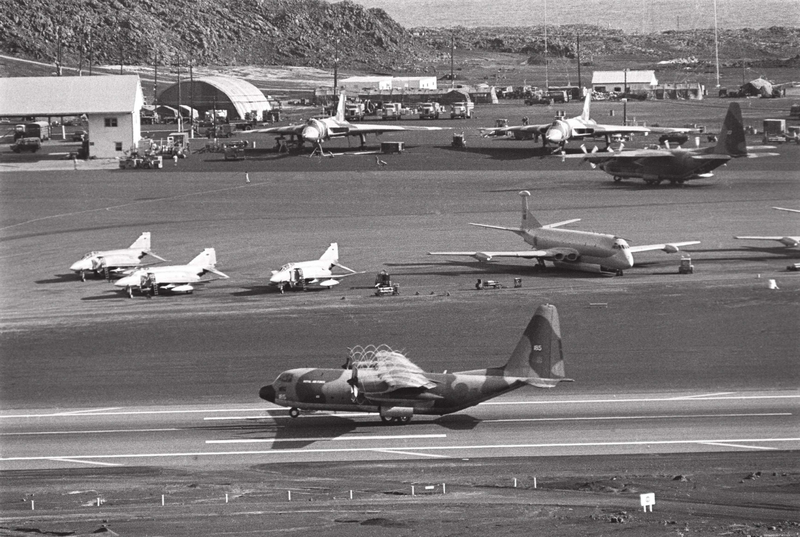 The Avro Vulcan was chosen for these missions. At this time only three squadrons were still active. Indeed it had been decided by the Ministry of Defence (MOD) that the Vulcan would formerly be retired from active duty in June of that year. 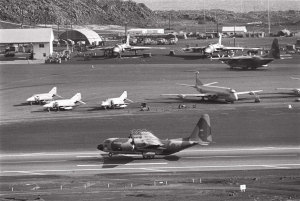 In order for the Vulcans to make the journey to Ascension Island and then, ultimately, on to the Falklands it was vital that they could be refueled in mid-air. 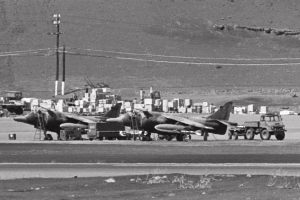 Although many Vulcans had retained their refueling probes (first fitted in the 1960's) the system had not been used for many years, and was inoperative. 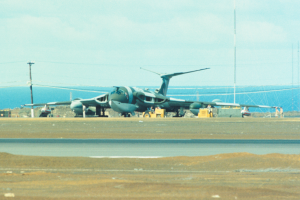 RAF personnel were required to repair the probes and fuel systems which resulted in some probes being "borrowed" from Nimrod and Hercules planes from British air bases and, in some instances, as far a field as Canada and the USA. It was decided that five Vulcans should be completely converted for the mission. 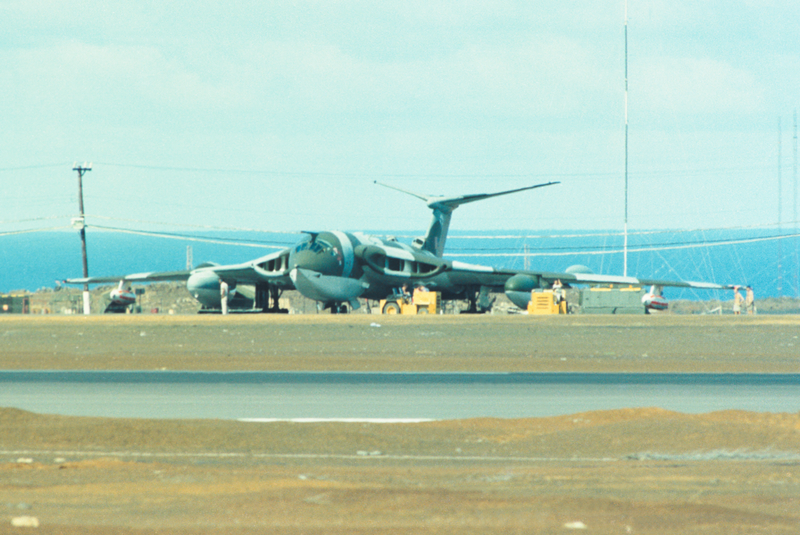 As well as the overhaul of the fuel system, the conversion process consisted of fitting bomb-carriers, Delco inertial navigation systems, Westering House ECM pods (to prevent detection from Argentine radar installations), the bottom surfaces were painted sea grey and the throttle controls were modified to allow full power to be taken from the Olympus 301 engines (this had previously been limited in order to promote longevity). 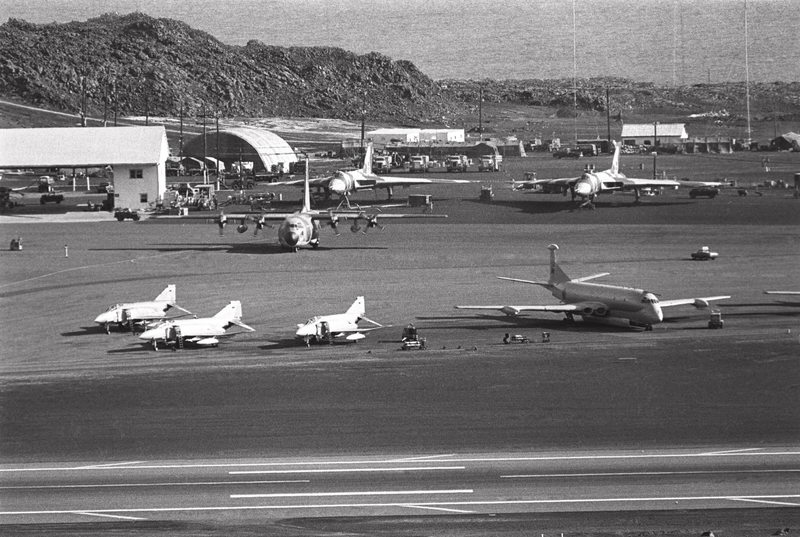 RAF Ascension Island has been used as a military airbase since 1942. Its strategic position, roughly half-way between the UK and the Falkland Islands, made it the ideal location to stage, what was then, the longest bombing sortie in history. The airfield, called Wideawake, has a 10,000ft asphalt runway. It was used by British forces as the base for Vulcan, Victor, Nimrod, Hercules and Harrier aircraft en-route to the Falklands. 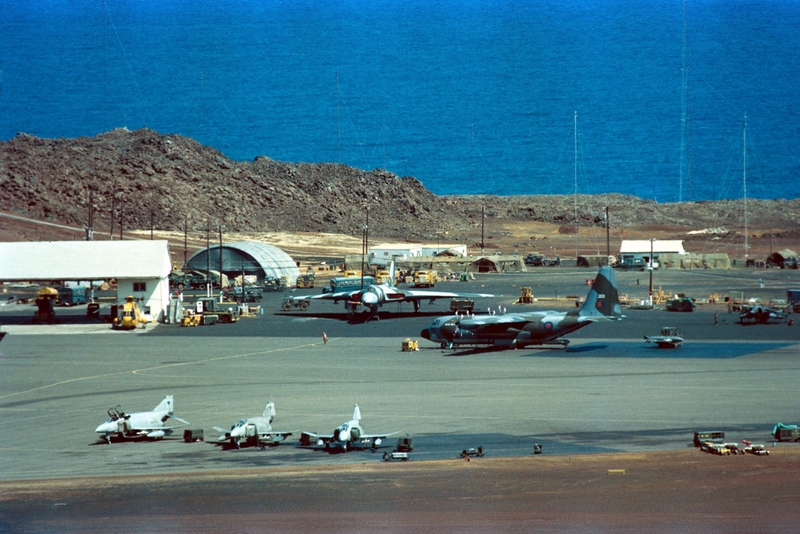 Bob Shackleton, from Cape Town, was residing on Ascension island during 1982. He took these excellent photos, and kindly allowed me to include them on this website. Click them to see bigger versions. Thanks to Bob Shackleton, Cape Town. and headed south towards their target. 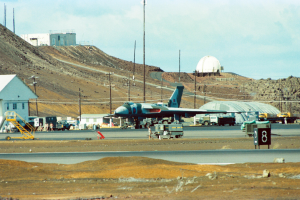 XM598 developed pressurisation problems and was forced to return to Ascension Island. This left just one Vulcan en-route to deliver its deadly cargo. It had been planned that the Vulcan would require five mid-air refueling. However due to turbulence and additional drag from the ECM pod XM607 actually required an addition refueling maneuver to take place. When XM607 was barely 300 miles from target she descended to her attack height of 250 feet. At this height she was able to fly under enemy radar, and could approach her target without detection. With fifty miles to go the pilot climbed back to 10,000 feet and after using the onboard radar to secure a "picture" of Port Stanley traveled towards the airfield in a diagonal attack run. This maximised the chance of the payload actually hitting their designated target. 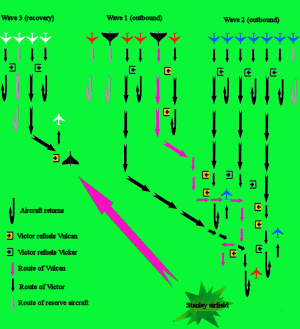 Although no Vulcans were shot down by enemy fire, not all the missions went as planned. On one mission XM597 was attempting a mid-air refueling when the refueling probe snapped off. 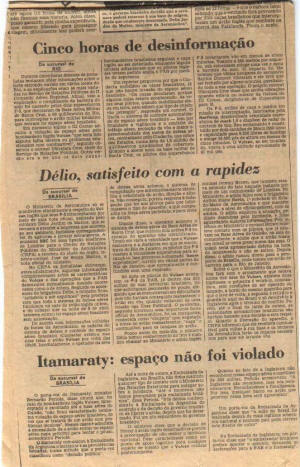 This left the aircraft without enough fuel to return to Ascension, and so she had to divert to Rio de Janeiro in Brazil. As it was, the Vulcan had to climb into thinner air so as to conserve as much fuel as possible. The two missiles she was carrying were launched to reduce weight and drag, but one of these stuck. Mission orders and other important documents were jettisoned into the sea via the crew hatch. After a "Mayday" signal was sent to the Brazilian authorities clearance was given to XM597. The captain, Neil McDougall, landed the aircraft with only 2000lb of fuel remaining. Not enough to complete a circuit of the airfield! 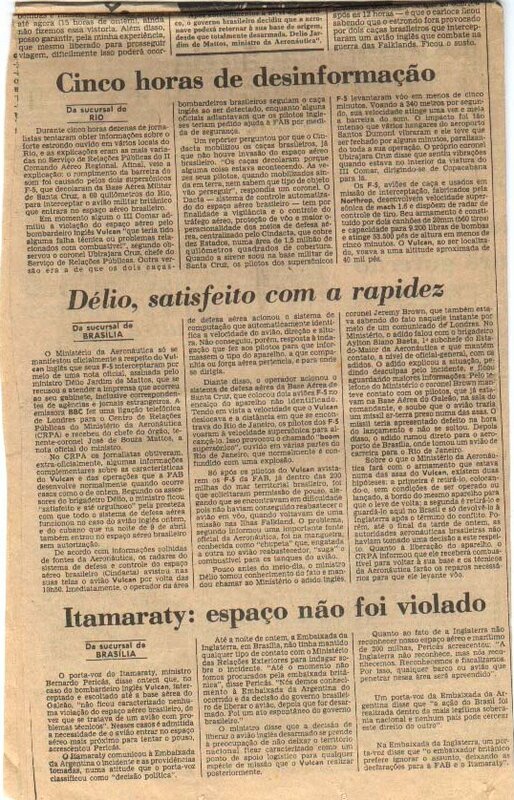 The Brazilian authorities impounded XM597 until the 10th of June but during their stay in Brazil both crew and aircraft were treated well. However the Brazilians did request the "jammed" missile as a souvenir of the Vulcan's visit. after making a forced landing due to lack of fuel. There were 7 Black Buck sorties flown against Argentinean forces. Each one was flown at night and all squadron markings and other distinguishing features were removed from the aircraft. In order that both ground-based and sea-based forces would be able to attack enemy forces dug-in across the Falklands it was clear that the runway at Port Stanley, used by the Argentines to launch air strikes, and to re-supply their troops from the mainland, needed to be destroyed. On the 30th April two Vulcans XM598 and XM607, accompanied by 11 Victor tankers left Wideawake to begin a long-range bombing sortie which was to last almost 6 hours. Shortly after take off cabin pressurisation problems resulted in Capt. 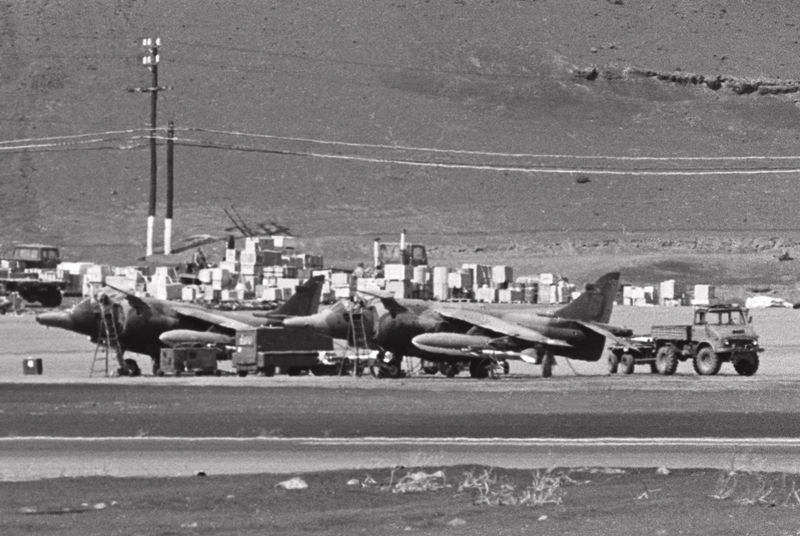 john Reeve returning to Ascension Island with XM598. The remaining Vulcan, Captained by Martin Withers continued. To prevent alerting the Argentinean forces of the impending attack the Vulcan was flown the last 200 miles at a height of 300 ft to prevent enemy radar detecting them. With 40 miles to the target the Vulcan climbed to 10000ft and began to approach the target. 21 one thousand pound bombs were dropped diagonally across the runway. One made a direct hit rendering the runway inoperable. 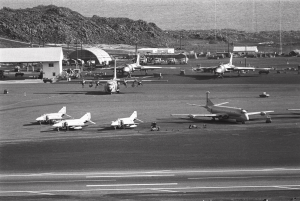 The others caused major damaged to parked aircraft and supplies. For this mission the Captain was awarded the Distinguished Flying Cross. A second sortie, using one Vulcan (XM607) armed with 21 one thousand pound bombs, attacked the runway and surrounding areas on the 3rd May. This resulted in peripheral damaged to the airfield, but no direct hits on the runway itself. 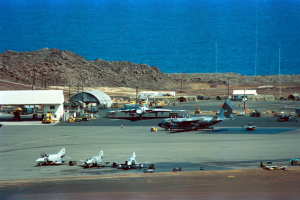 Captain John Reeve and crew returned safely to Ascension Island. enemy use of the facility, was cancelled due to bad weather. This mission had to be aborted due to the failure of a Victor tanker refueling drogue. 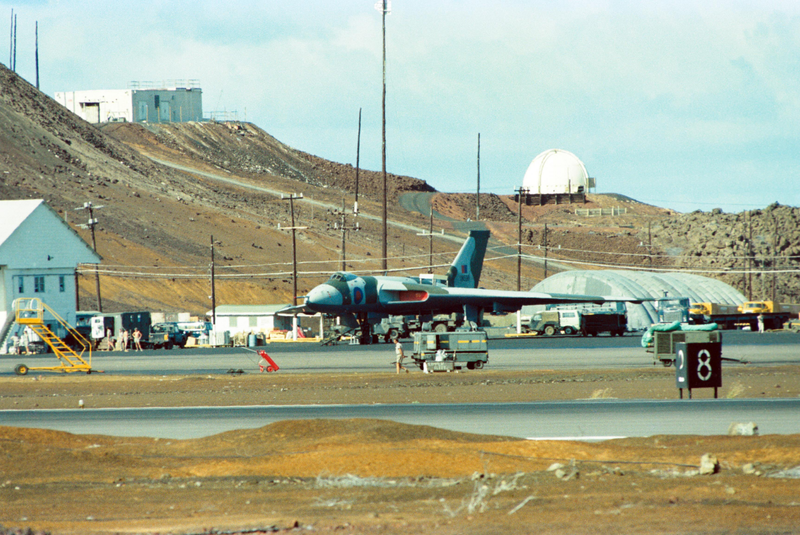 Captain Neil McDougall, and Vulcan XM597, were forced to return to Ascension island 5 hours after leaving to attack Radar installations with Shrike pylon-mounted missiles. By 30th May it was decided that enemy radar emplacements needed to be destroyed as they were hampering attempts by the RAF and Royal Navy to launch carrier-based Harrier attacks. XM597, captained by Neil McDougall, was equipped with wing-mounted Shrike missiles. This left room in the bomb-bay for the addition of spare fuel tanks. These tanks gave the Vulcan the ability to spend longer over the target area "looking" for enemy radar installations. The Shrikes were launched and caused damage to one radar installation. On the 2nd June Capt. Neil McDougall flew XM597, armed with Shrike anti-radar missiles, to attack radar installations. 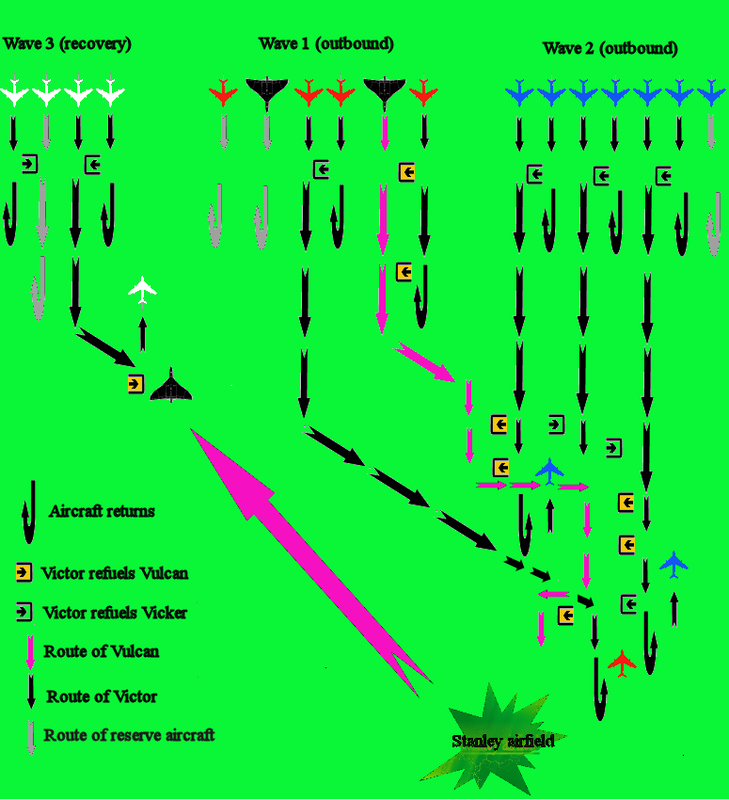 The Vulcan was detected by enemy forces who immediately switched their radar off, thus preventing the Shrike missiles from gaining a lock. After almost 45 minutes the Shrike located, and locked-on to, Argentinean radar emissions. Two missiles were launched and the enemy ground-based radar was destroyed. However, on the return leg of the mission, during a scheduled refuel with a Victor tanker, the refueling probe became damaged. as the Vulcan could not take on enough fuel to return to Wideawake the Captain had to divert to the only airfield he could reach before running out of fuel. 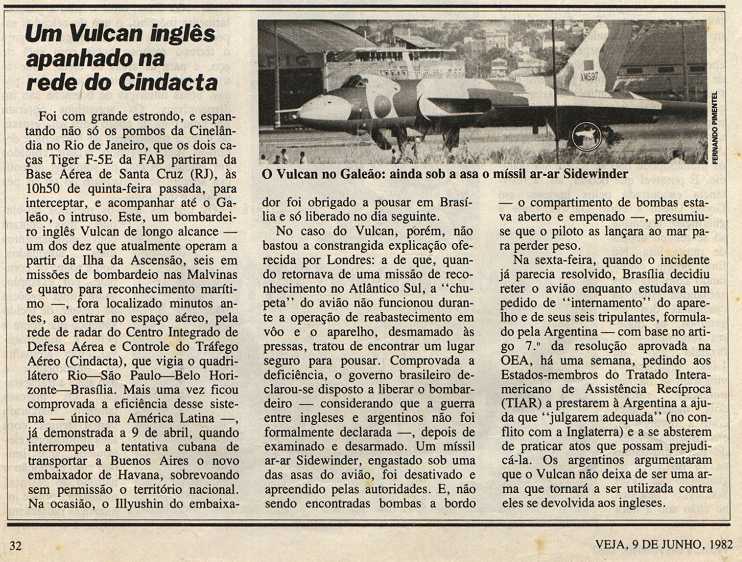 Thanks to his skill the Vulcan was landed at Rio de Janeiro (Galeao Airport). The aircraft, and her crew, were impounded for a week before being released on condition that XM597 took no further part in the conflict. Capt. Neil McDougal received the Distinguished Flying Cross for this, and previous sorties. This final mission was flown by XM607 (Capt. Martin Withers) on 11th June 1982. 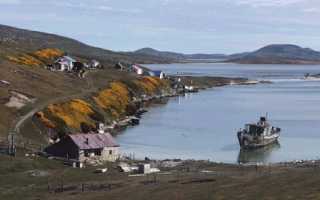 It dropped both anti-personnel and iron bombs on equipment and stores located in the vicinity of Stanley Airfield. on the 14th June 1982. Argentina continues to claim the island, but the British Government refuses to participate in further negotiations. The BBC have produced an excellent overview of the conflict. Only time will tell if another conflict over the isles will re-occur. One thing is for sure however, the Vulcan will not play a part in deciding the outcome next time.